What is fraud and why is it interesting for Data Science? Fraud can be defined as “the crime of getting money by deceiving people” (Cambridge Dictionary); it is as old as humanity: whenever two parties exchange goods or conduct business, there is the potential for one party scamming the other. With an ever-increasing use of the internet for shopping, banking, filing insurance claims etc., these businesses have become targets of fraud in a whole new dimension. Fraud has become a major problem in e-commerce and a lot of resources are being invested to recognize and prevent it. Traditional approaches to identifying fraud have been rule-based. This means that hard and fast rules for flagging a transaction as fraudulent have to be established manually and in advance. But this system isn’t flexible and inevitably results in an arms race between the seller’s fraud detection system and criminals finding ways to circumnavigate these rules. The modern alternative is to leverage the vast amounts of Big Data that can be collected from online transactions and model it in a way that allows us to flag or predict fraud in future transactions. For this, Data Science and Machine Learning techniques such as Deep Neural Networks (DNNs) are the obvious solution! 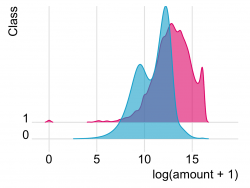 A synthetic financial dataset for fraud detection is openly accessible via Kaggle. It has been generated from a number of real datasets to resemble standard data from financial operations and contains 6,362,620 transactions over 30 days (see Kaggle for details and more information). By plotting a few major features, we can already get a sense of the data. The two plots below, for example, show us that fraudulent transactions tend to involve larger sums of money. When we also include the transaction type in the visualization, we find that fraud only occurs with tranfers and cash-out transactions and we can adapt our input features for machine learning accordingly. Fraudulent transactions tend to involve larger sums of money. This plot shows the distribution of transferred amounts of money (log + 1) in fraudulent (Class = 1) and regular (Class = 0) transactions. Fraud only occurs with tranfers and cash-out transactions. 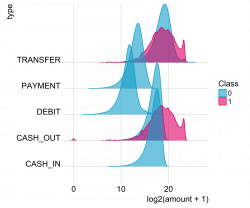 This plot shows the distribution of transferred amounts of money (log + 1) in different transaction types for fraudulent (Class = 1) and regular (Class = 0) transactions. In preparation for machine learning analysis, dimensionality reduction techniques are powerful tools for identifying hidden patterns in high-dimensional datasets. In addition, we can use them to reduce the number of features for machine learning while preserving the most important patterns of the data. Similar approaches use clustering algorithms, like k-means clustering. The most common dimensionality reduction technique is Principal Component Analysis (PCA). PCA is good at picking up linear relationships between features in the data. The first dimension, also called the first principal component (PC), reflects the majority of variation in our data, the second PC reflects the second-biggest variation and so on. When we plot the first two dimensions against each other in a scatterplot, we see patterns in our data: The more dissimilar two samples in our dataset, the farther apart they will be in a PCA plot. PCA will not be able to deal with more complex patterns, though. For non-linear patterns, we can use t-Distributed Stochastic Neighbor Embedding (t-SNE). In contrast to PCA, t-SNE will not only show sample dissimilarity, it will also account for similarity by clustering similar samples close together in a plot. This might not sound like a major difference, but when we look at the plots below, we can see that it is much easier to identify clusters of fraudulent transactions with t-SNE than with PCA. PCA and t-SNE can both be used with machine learning. 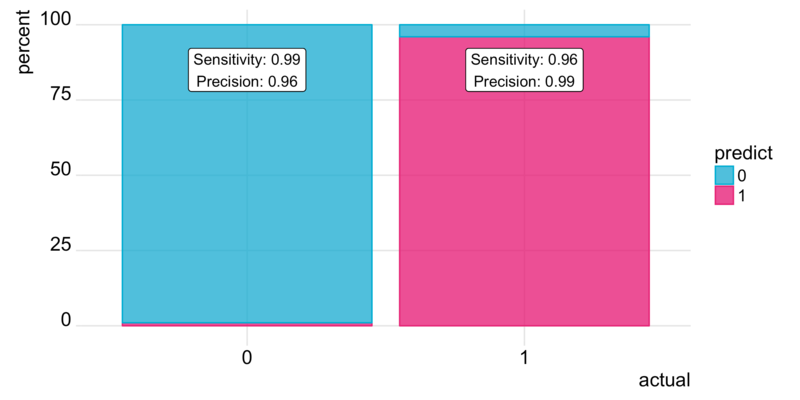 Here, I want to use dimensionality reduction and visualization to perform a sanity check on the labelled training data. Because we can assume that some fraud cases might not have been identified as such (and are therefore mis-labelled), we could now advise to take a closer look at non-fraud samples that cluster with fraud cases. 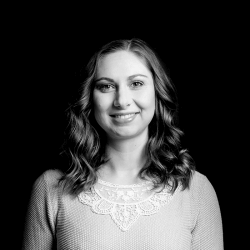 Dimensionality reduction techniques in fraud analytics. 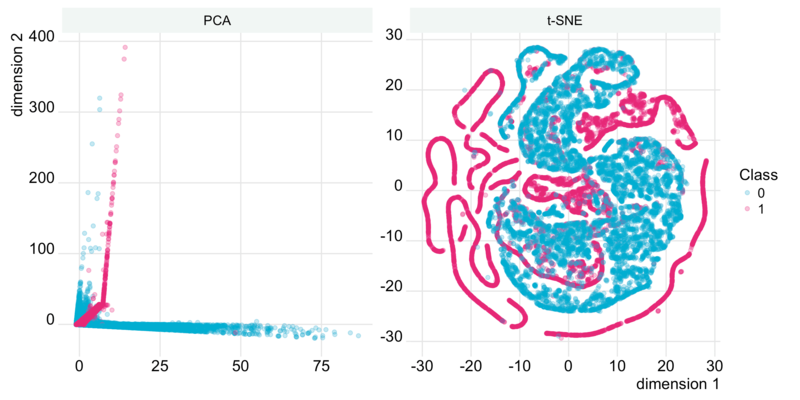 The plots show the first two dimensions of PCA (left) and t-SNE (right) for fraudulent (Class = 1) and regular (Class = 0) transactions. Which Machine Learning algorithms are suitable for fraud analysis? Machine learning is a broad field. It encompasses a large collection of algorithms and techniques that are used in classification, regression, clustering or anomaly detection. Two main classes of algorithms, for supervised and unsupervised learning, can be distinguished. Supervised learning is used to predict either the values of a response variable (regression tasks) or the labels of a set of pre-defined categories (classification tasks). Supervised learning algorithms learn how to predict unknown samples based on the data of samples with known response variables/labels. Data labelling: In many cases, fraud is difficult to identify. Some cases will be glaringly obvious – these are easy to recognize with rule-based techniques and usually won’t require complex models. Where it becomes interesting are the subtle cases; they are hard to recognize as we don’t usually know what to look for. Here, the power of machine learning comes into play! But because fraud is hard to detect, training data sets from past transactions are probably not classified correctly in many of these subtle cases. This means that the pre-defined labels will be wrong for some of the transactions. If this is the case, supervised machine learning algorithms won’t be able to learn to find these types of fraud in future transactions. Unbalanced data: An important characteristic of fraud data is that it is highly unbalanced. 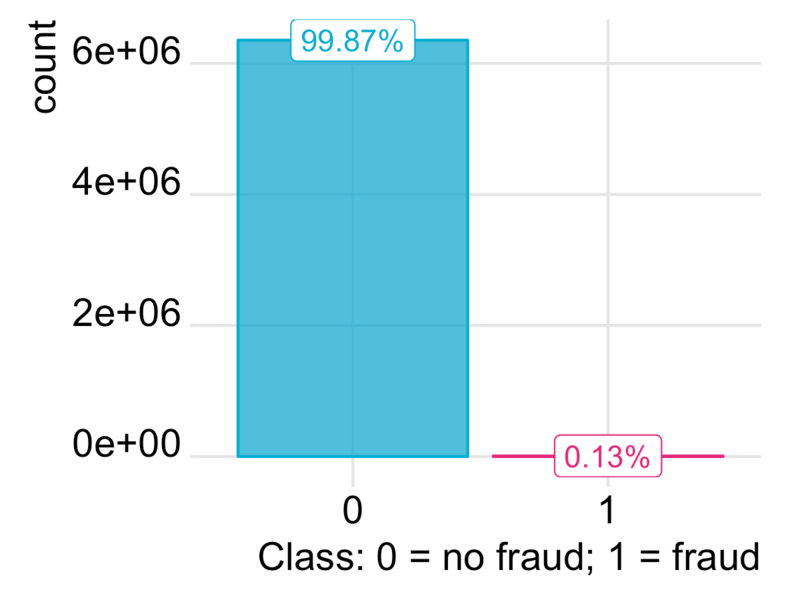 This means that one class is much more frequent than the other; in our example, less than 1% of all transactions are fraudulent (see figure “Synthetic financial dataset for fraud detection”). Most supervised machine learning classification algorithms are sensitive to unbalance in the predictor classes, and special techniques would have to be used to account for this unbalance. Synthetic financial dataset for fraud detection. Fraud cases are rare compared to regular transactions; in the simulated example dataset less than 1% of all transactions are fraudulent. Unsupervised learning doesn’t require pre-defined labels or response variables; it is used to identify clusters or outliers/anomalies in data sets. 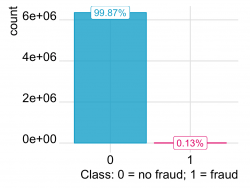 In our fraud example data set we don’t trust the predictor labels to be 100% correct. But we can assume that fraudulent transactions will be sufficiently different from the vast majority of regular transactions, so that unsupervised learning algorithms will flag them as anomalies or outliers. Neural networks are applied to supervised and unsupervised learning tasks. Autoencoder neural networks are used for anomaly detection in unsupervised learning; they apply backpropagation to learn an approximation to the identity function, where the output values are equal to the input. They do so by minimizing the reconstruction error or loss. Because the reconstruction error is minimized according to the background signal of regular samples, anomalous samples will have a larger reconstruction error. For modeling, I am using the open-source machine learning software H2O via the “h2o” R package. On the fraud example data set described above, an unsupervised neural network was trained using deep learning autoencoders (Gaussian distribution, quadratic loss, 209 weights/biases, 42,091,943 training samples, mini-batch size 1, 3 hidden layers with [10, 2, 10] nodes). The training set contains only non-fraud samples, so that the autoencoder model will learn the “normal” pattern in the data; test data contains a mix of non-fraud and fraud samples. We need to keep in mind, though, that autoencoder models will be sensitive to outliers in our data in that they might throw off otherwise typical patterns. This trained autoencoder model can now identify anomalies or outlier instances based on the reconstruction mean squared error (MSE): transactions with a high MSE are outliers compared to the global pattern of our data. The figure below shows that the majority of test cases that had been labelled as fraudulent indeed have a higher MSE. We can also see that a few regular cases have a slightly higher MSE; these might contain cases of novel fraud mechanisms that have been missed in previous analyses. 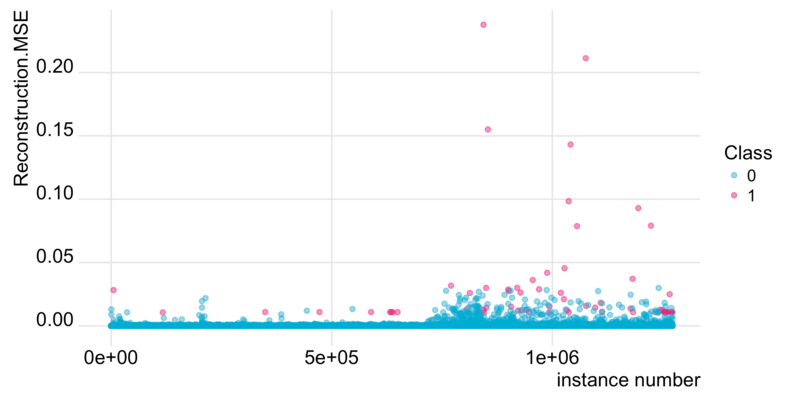 This plot shows reconstruction MSE (y-axis) for every transaction (instance) in the test data set (x-axis); points are colored according to their pre-defined label (fraud = 1, regular = 0). Autoencoder models can also be used for pre-training supervised learning models. On an independent training sample, another deep neural network was trained – this time for classification of the response variable “Class” (fraud = 1, regular = 0) using the weights from the autoencoder model for model fitting (2-class classification, Bernoulli distribution, CrossEntropy loss, 154 weights/biases, 111,836,076 training samples, mini-batch size 1, balance_classes = TRUE). Model performance is evaluated on the same test set that was used for showing the MSE of the autoencoder model above. The plot below shows the predicted versus actual class labels. Because we are dealing with severely unbalanced data, we need to evaluate our model based on the rare class of interest, here fraud (class 1). If we looked at overall model accuracy, a model that never identifies instances as fraud would still achieve a > 99% accuracy. Such a model would not serve our purpose. We are therefore interested in the evaluation parameters “sensitivity” and “precision”: We want to optimize our model so that a high percentage of all fraud cases in the test set is predicted as fraud (sensitivity), and simultaneously a high percentage of all fraud predictions is correct (precision). An optimal outcome from training a supervised neural network for binary classification is shown in the plot below. Results from training a supervised neural network for binary classification. 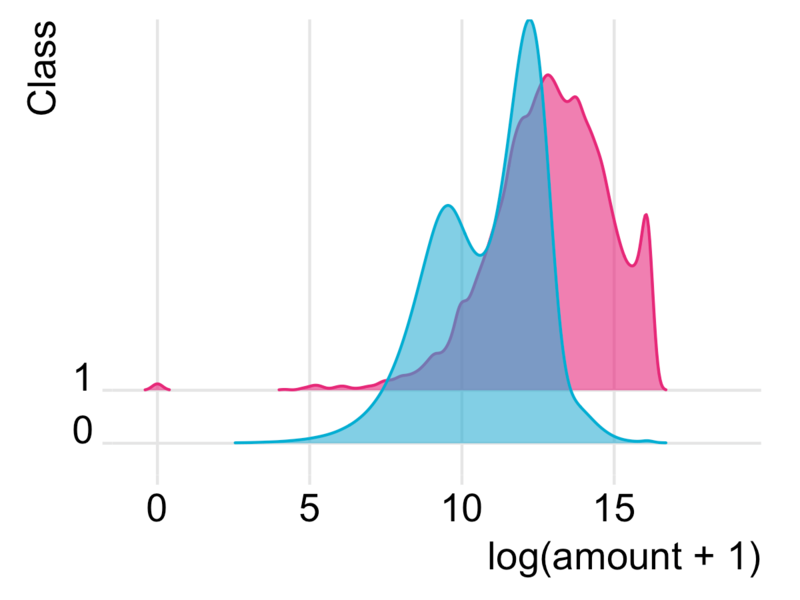 The plot shows the percentage of correctly classified transactions by comparing actual class labels (x-axis) with predicted labels (color; fraud = 1, regular = 0). Decisions made by machine learning models are inherently difficult – if not impossible – for us to understand. The complexity of some of the most accurate classifiers, like neural networks, is what makes them perform so well. But it also basically makes them a black box. This can be problematic, because executives will be less inclined to trust and act on a decision they don’t understand. Local Interpretable Model-Agnostic Explanations (LIME) is an attempt to make these complex models at least partly understandable; With LIME, we are able to explain in more concrete terms why, for example, a transaction that was labelled as regular might have been classified as fraudulent. The method has been published in “Why Should I Trust You? Explaining the Predictions of Any Classifier” by Marco Tulio Ribeiro, Sameer Singh and Carlos Guestrin from the University of Washington in Seattle. It makes use of the fact that linear models are easy to explain; LIME approximates a complex model function by locally fitting linear models to permutations of the original training set. On each permutation, a linear model is being fit and weights are given so that positive weights support a decision and negative weights contradict them. In sum, this will give an approximation of how much and in which way each feature contributed to a decision made by the model.